It’s no wonder apples are such a popular fruit: they’re crunchy, juicy, sweet, and tart, and they have a reputation for being good for us. Most people have a favorite variety—maybe yours is McIntosh, Jonagold, or Granny Smith—but all apples have some important things in common: vitamins, minerals, and fiber. One large apple is a good source of dietary fiber, providing 20%DV (percent daily value). Their prebiotic fiber, which includes both insoluble fibers like cellulose and soluble fibers like pectin, may help to support healthy colonies of friendly gut bacteria. That same apple also provides 7%DV of potassium and 4%DV of vitamin C. Apples also have plant chemicals known as polyphenols, which are found mainly in the peels. 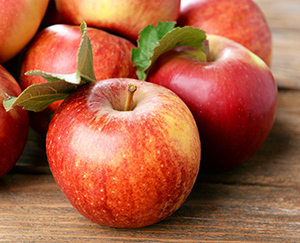 Polyphenols provide apples with their color and flavor and protect the fruit from light damage, fungi, and insects. The health effects of polyphenols are the subject of ongoing research and depend on the amount consumed and on their bioavailability. Eating an apple a day may indeed help keep the doctor away. In one study, people who ate 2–7 apples per week were found to have a 27–28% lower risk of diabetes compared with people who didn’t eat apples. And, while research continues, several studies have found that people who eat apples may have a lower risk of heart disease, one of the most pressing health concerns for people with diabetes. Eating more apples can be easy and delicious. Cutting a fresh, unpeeled apple into your morning bowl of oatmeal adds color and tang to breakfast. Biting into a whole apple is a juicy way to satisfy a midday craving. Because apples are both sweet and tart, they’re a perfect complement to savory dishes like salads, stews, and casseroles. Apples also make famously scrumptious desserts, but to avoid some of the extra fat, sugar, and calories in pies and cobblers, try your hand at baked apples instead. Cored apples that are stuffed with pecan or almond pieces, drizzled with maple syrup, sprinkled with cinnamon, dotted with butter, and baked until soft make an elegant dessert.